I am always intrigued by what people are reading, and often ask. I have around thirty bedside books dipped into (mostly poetry or about poetry), almost completed, or not begun, as I am sure is the case with many of us – especially for those who attended the wonderful Free Verse Book Fair in September, where over sixty poetry publishers (the majority small presses) and organisations were represented. I couldn’t make it, but enjoyed seeing the photos – all those varieties of poet milling around in the same room! So I thought I’d ask our poets about their reading habits/ recommendations. Some are reading for research or review purposes. Richard Berengarten is working on a long poem entitled ‘Changing’, based on theI Ching. His recommendation is SE Farmer’s Syncretism in the West (Pico’s 900 Theses, 1486): ‘an inspiring book about a great Renaissance thinker. Syncretic or correlative thinking is one of the foundations of poetic composition’, as is evident in Richard’s own poem, Now, published in this issue. Sophie Herxheimer, who is also a visual artist, speaks of her ‘folk and fairy tale habit… where the ordinary and the absurd most regularly meet’ (mine too!). She is currently reading Sarah Maitland’s Gossip from the Forest, which records her travels through twelve British forests, as part of her own research for a residency at Fermynwoods Contemporary Art. Tamar Yoseloff, having recently taught a Poetry and Art course in Spain has been immersing herself in ekphrastic poetry, including that of WS Graham and Frank O’Hara. Alistair Noon is persevering with Plato, ‘because I have tried twice before and am determined to make it to the end this time.’ Alistair recommends Poemsby Seán Rafferty, ‘possibly the most under-recognized British poet of the 20th century.’ John Greening, currently editing Edmund Blunden’s Undertones of War, writes: ‘A long poem that should be better known is John Gurney’s occult (but not yet cult) epic poem War. Largely ignored when it appeared, but of major importance.’ Jon Stallworthy, editor of The New Oxford Book of War Poetry, is Patricia McCarthy’s recommendation, and in particular his long poem, ‘The Anzac Sonata’ from the book of the same title. 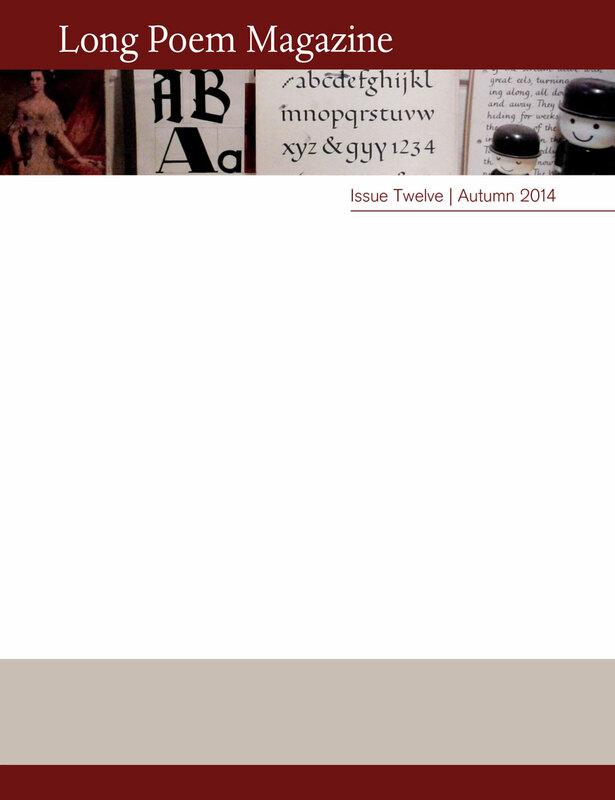 Her poem ‘Another War Horse’ appears in this issue. For me, these insights into our poets’ reading habits elucidate their own work, represented in these pages by a single artefact, and add to my appreciation – they become rounder, more intriguing individuals, fully engaged as they are with the world of literature. I wonder what reading lists fellow poets would prescribe for each other? We should like to inform you that Ann Vaughan-Williams has decided to step down as co-editor of Long Poem Magazine. Ann has been with the magazine since its inception and has been a much valued member of our team. We are sorry to see her go and thank her for all her hard work.